The station, which you can see here, is basically a stand with a few iPhone charging cables dangling out of it and a cubby for you to rest your iPhone. 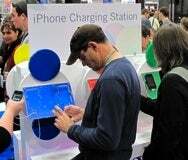 As you’re waiting for your iPhone to charge (and don’t expect your iPhone to last the entire day at Macworld Expo—ha ha!) you are free to take in all the goodies that Google has to offer. A brilliant marketing idea and useful to boot.